GARY David will now have to try and earn his first ever PBA championship elsewhere. San Miguel management decided to waive the veteran gunner from Lyceum over the weekend, effectively making the 38-year-old David an unrestricted free agent, SPIN.ph learned. Apparently, the Beermen no longer have any room for David at the wings, especially with the drafting of rookie pick Rashawn McCarthy and the acquisition of young sophomore Keith Agovida from Blackwater following the trade for RR Garcia. David’s maximum monthly salary of P420,000 may also be too expensive for the franchise to maintain under the team's salary cap. Hopes were high for the former Gilas stalwart to finally win his very first league title the moment he joined the Beermen as a free agent midway through last season’s Commissioner’s Cup following an unpleasant falling-out with former team Meralco. Unfortunately, the Beermen were too crowded in his position and David never got to crack coach Leo Austria’s rotation, spending his brief stay with the multi-titled franchise mostly sitting on the bench. In the two conferences he suited up for San Miguel, the team just made the semifinals of both the Commissioner’s and Governors Cup, with the Beermen bowing out against eventual champion Barangay Ginebra in the deciding Game Five of their series during the season-ending meet. 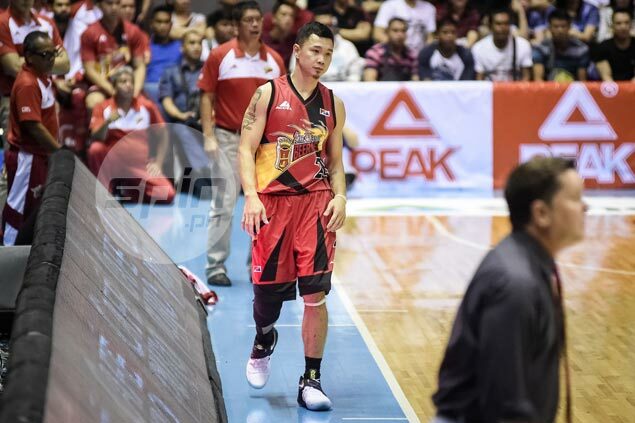 The release of David by the Beermen meant any team interested in his services can now sign him up. “I think he can still be a major help to any team. But he can’t command the same price anymore,” said one team executive, who refused to be named as he’s not authorized to speak on behalf of his ballclub or David.